Publisher's comment: Glen for many years has lived according to the "no preamp is the best preamp" mandate. Assigning to him one of the very few preamplifiers with a direct-heated power triode in the circuit was deliberate (the only other ones I'm aware of are by Manley and Sakuma while Allnic Audio Labs from Korea is preparing a short line of phono stage, preamp and power amp models that will be completely DHT for all their signal-path tubes). Should such a machine diverge much from the path of utter neutrality, a listener like Glen would be most keyed in to notice. Conversely, if such a machine brought something to the party that seemed superior to stark neutrality, Glen would likewise be perfectly placed to comment. Considering the many preconceptions which are attached to tube gear in general and direct-heated triodes in particular, the reader is encouraged to keep Glen's particular background in mind - Ed. The Reference 2S linestage marks the second statement preamplifier from Audio Space and follows fast on the heels of the very well received Reference 2. For those unfamiliar with Audio Space, it should be noted that they are no newcomer to the field. The Reference line is the culmination of 10 years of effort by Peter Lau, chief designer and founder of Hong Kong-based Audio Space. It follows a long tradition of high-quality high-value vacuum tube products which have earned numerous awards over the years. 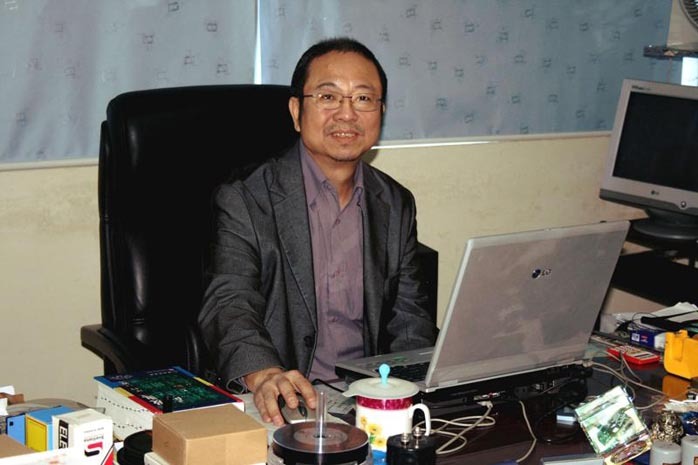 In fact Peter Lau was voted one of the 10 most influential living tube amplifier designers in Japan. Although Audio Space is better known in the Orient, the recent introduction of their Reference line has quickly turned heads and propelled Mr. Lau to the front lines as a major player in the top rank of audio’s high end. Measured against that level of success, his latest offering must contend with some very high expectations. Has Audio Space succeeded? The Reference 2S is a simplified version of the Reference 2 preamp. This linestage is Peter Lau’s second Reference offering with a similar appearance and potentially similar performance. There are two major differences however. First, the balanced configuration has been dropped. For those running single-ended systems, this will not be an issue. Second, there is no phono stage. Vinyl devotees will have to supply their own. Other changes? 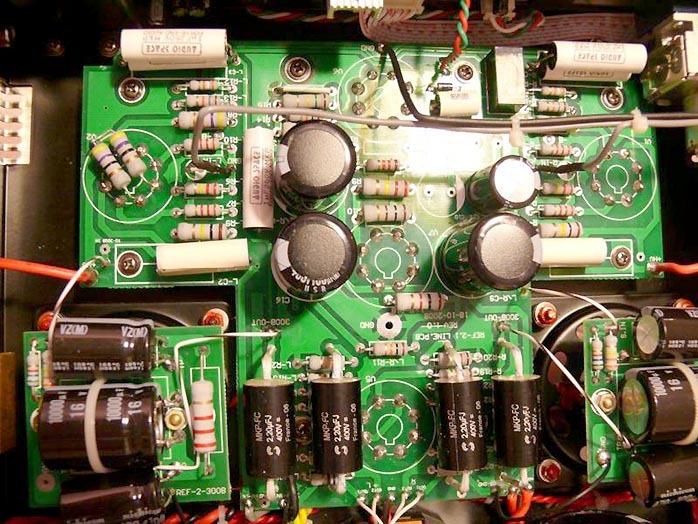 The polarity inversion feature has been eliminated and the design now employs circuit boards rather than being point-to-point wired. It has 4 single-ended inputs and one record output. This model also has a smaller footprint than the Reference 2. 'Simplified' here is only a relative term however. Peter Lau seems to have substituted an equally intriguing feature for each one he took away. The Reference 2S offers a choice of driver (300B or 2A3) as well as rectifier tube. 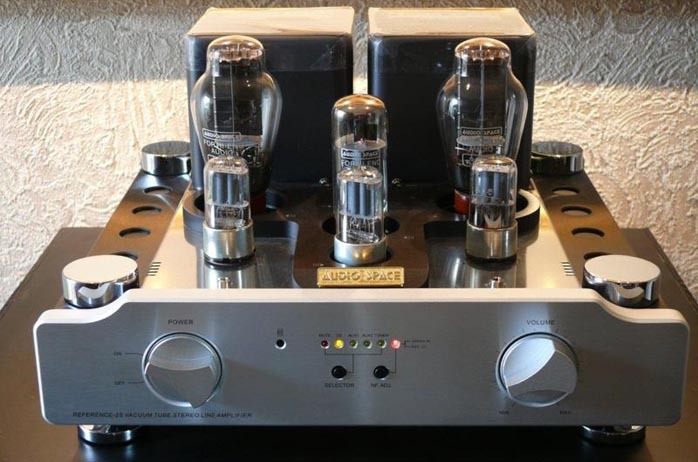 "Designed with consideration for those tube lovers who like to fine tune their equipment by changing tubes, the Reference 2S can give audiophiles who enjoy tube rolling a lot of fun.The pair of driver tubes can be changed from 300B to 2A3 by switching the voltage selector switch from 5V to 2.5V. The rectifier tube can be changed from EL34 to most quad and pentode GT power tube types such as KT66, 6L6GC, 5881, EL77, 6550, KT90, KT99 etc. provided that the base of the tube is not metal*." *"If the base of the GT power tube is made of metal, one has to make sure that the metal base has no connection to the negative pole (pin number 8 of the tube). A high-voltage electric shock could occur in this case. When such a tube is used as a rectifier, the metal base carries high voltage if it is connected to pin number 8 of the tube (the negative pole)." The Reference 2S offers an unusual feature. It has two sets of outputs, one anode direct, the other through the cathode follower. Combined with selectable feedback on the front panel, this presents the prospective owner with an almost unlimited flexibility to achieve the desired sound. 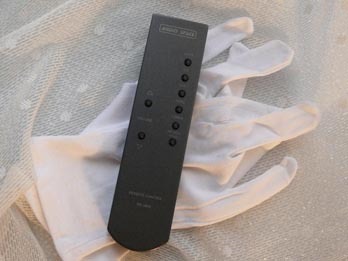 Many will also be pleased to learn that Audio Space has added a very hefty metal remote. And that’s about it for the differences to the top model. Except one. Price. The Reference 2 demands CND$10,890. The price of the Reference 2S is CND $4299. Need I say more?